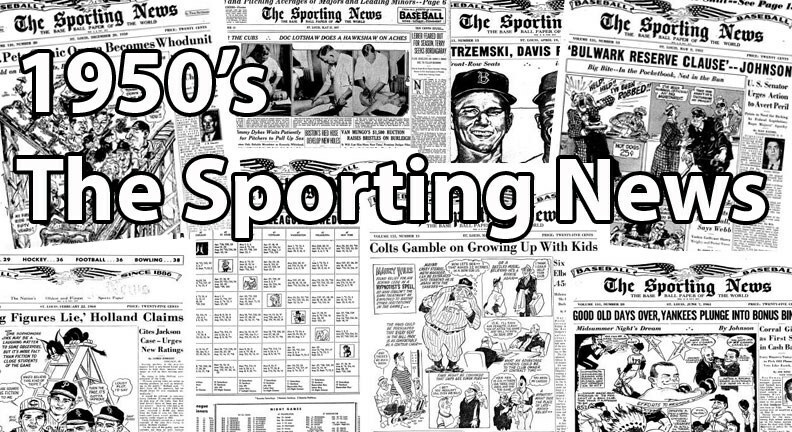 The Sporting News (or now known as TSN) was released on a weekly basis and featured sports news, editorial pieces, and rumors. TSN was printed in black-and-white and included box scores from all major league games. Mailing labels were not attached to the newspaper until November 1981, making the early issues desirable by collectors. Values of The vintage Sporting News back issues vary greatly. The old Sporting News Magazine issues are obviously more valuable due to rarity and the conditions are usually not as nice. The old Sporting News back issues that were published during baseball season include boxscores and game synopses and are generally 25% higher than off season issues. Click here to read more about The Sporting News issues from the 1950's! CLICK HERE if you want to sell your 1950's Sporting News cards. Showing 1 to 100 of 218 products.